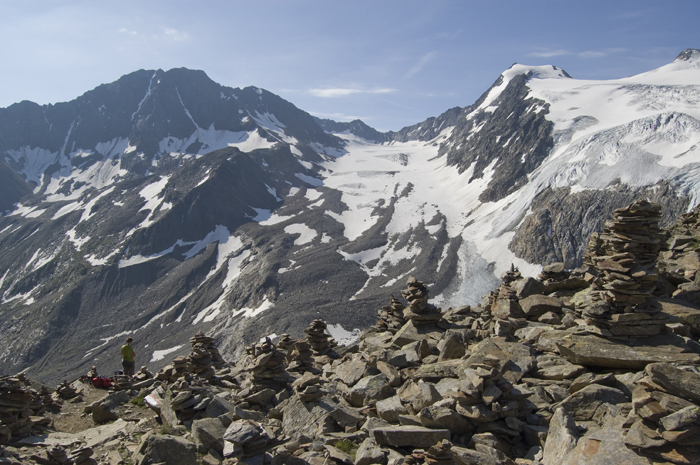 This magnificent trek follows a ring of excellent huts in the beautiful Stubai Alps. Superb views of snowy peaks, mountain lakes, shimmering glaciers and classic “Alpine” meadows massed with flowers. This famous walk can be varied in length and toughness to suit your fitness and timescale. Walkopedia really covets this marvellous and rightly famous hut-to-hut walk, which follows a circuit along the upper slopes of the horseshoe of mountains above the Stubaital valleys, which straddle the border between Austria and Italy. The scenery is spectacular, with superb views of snowy peaks, mountain lakes, shimmering glaciers and typical “Alpine” meadows massed with flowers. Far-reaching views from the highest points, from the Swiss Alps to the Dolomites. A variety of wildlife can be seen, including the lovable marmot, chamois, ibex and various raptors and vultures. There is some confusion about this walk’s name. The maps (and others) refer to it as the Stubaier Höhenweg. But it is also known as the Stubai Runde Tour or the Rucksack Route. The Cicerone book insists that the latter names are correct and that the Höhenwerg applies to the less used Glacier Tour. The full route is some 80 km long and officially takes 9 days, staying in 8 huts, although the fit could combine some days. There are, however, several roadheads in the Stubaital and Oberbergtal, from/to which you can climb/descend to/from huts on the route, so you can walk shorter stretches: for instance, starting at the Nürnberger hut to make a truncated version, called by some the Stubai Horseshoe, a 6 or 7 day walk. (See our Stubai Alps page for other good shorter versions of this route). From any start point on the valley floor, the path takes you up through the steep lower landscape, usually mixed (but pine dominated) forest, to the green pastureland above. Here you walk through classic Alpine scenery complete with grazing animals, traditional farming methods and verdant meadows, decorated by a profusion of wild flowers, streams and waterfalls. As the trail reaches higher altitudes the green gives way to harsher but magnificent mountain scenery. Once you are up in the high country, this is a delightful walk, and strenuous but not inherently excessively demanding. (That said, the full route apparently involves some 8,000m of ascent and descent.) Altitude varies between 2200m – 2900m. The Weg’s rocky tracks cross boulder fields and can climb steeply over slippery shale and loose stone, but afford magnificent views over ridges towards awe-inspiring peaks, or down onto turquoise lakes. The toughest parts of the walk negotiate narrow, steep ledges, cross patches of snow-covered ground and pass directly beside the formidable beauty of vast blue (albeit more often dirty) glaciers. Day one of the main route is a 10km, 5hr, 1,400m ascent from the road at Neder to the Innsbrucker Hut, which you can reduce with a jeep lift to the Pinnisalm. Day two is one of the best of all, a long (7-8hr) trek over three cols to the ridgetop Bremer Hut. Day three is a beautiful 5km, 4hr traverse to the large Nürnberger Hut. Lovely glacier and peak views and some side climbs if you want. (A popular place to start a short version of the route is the Nűrnberger Hut car park above Ranalt in the Unterbergtal; a 2-3 hour, 5km walk, taking you up into the high mountains to the Nürnberger Hut. A stiff 900m climb though). Day four has varying alternatives for getting across the magnificent western ridge to the Sulzenau Hut in its wide bowl, including the Wilder Freiger glacier (and summit at 3,413m) and Mairspitze. See our Above Nurnberg Hut. Day five also has alternative ways of crossing the high ridge on the way to the Dresdner Hut. This hut sits in a ski-scarred area, so don’t be disappointed. Note – there is an nearby summer cablecar open, so this is an easy place to get to leave the high ground. Day six is 7-8 hour, 12 km walk which climbs the Grawagrubennieder (2,888m), descending by a steep, challenging route to the Neue Regensburger Hut. Optional side trip to the Egesegrat (1 hour). Day seven is a 5 hour, 7km walk via the Schrimmennieder col to the Franz Senn Hut. Optional side trip to the Rinnensee (1.5 hours). See our Above Franz Senn Hut page. Day eight is another classic, a 6-7 hour, 13km walk along the Franz Senn Weg (refreshments are available after 2 hours at the Seduck Hoch Alm) to the ridge of the Sendersjöchl with views to the Northern Limestone Alps, then on to the Seejöchl with views across the Innsbruck valley and finally descending to the Starkenburger Hut. Alternatively, you can head north and cross further ridges to the Potsdamer hut. You are on level ground here, so will enjoy a greener but still wonderous world. Day nine is a 2.5 hour, 6 km walk, descending gently to the village of Neustift.Could be combined with Day 8 to shorten the walk. There are variants on some of the days (some more suitable for experienced walkers), and you can divert to local peaks, so you can to a degree choose how long and strenuous you want your days to be. The walk can be extended at the beginning by a further two or three days if desired, and walked in either direction, although east-west is the norm. Walkopedia has so far walked stretches above the Nürnberger Hut. We are keen to get back one day to tackle the whole route. The sun can be strong yet the possibility of a sudden snowstorm should not be discounted at any time. The route is well signed and marked by cairns, with cables to assist the steepest parts. We spend two nights in the Nurenberger Hut in August 2018, climbing Mairspitze on a Hohenweg alternative route. I REALLY want to get back and walk the whole route. We leave the Nürnberger Hut at a leisurely 9.15 - we aren't on the trail all day - after a filling breakfast of muesli with yoghurt and honey.